When you make something twice in two days and it disappears every single time you make it then you know the recipe is a keeper! This is my story with this Coconut Sweet aka homemade Toasted Coconut Flakes. 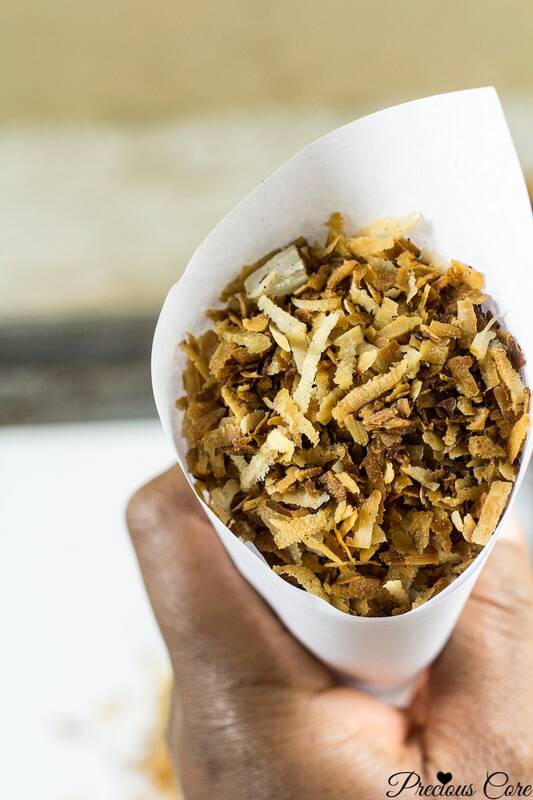 These are Toasted Coconut Flakes made from fresh coconut and they are insanely delicious! My hands forget discipline when this thing is in the house. I mean, I start eating it when I am still making it. I grab some of the hot one straight off the pan then I weep a little because of how good it is. Coconut sweet, how I love thee! 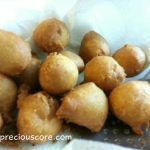 Coconut Sweet is a popular snack in Cameroon which is made by cutting coconut into shreds then gently toasting it until brown and crispy. 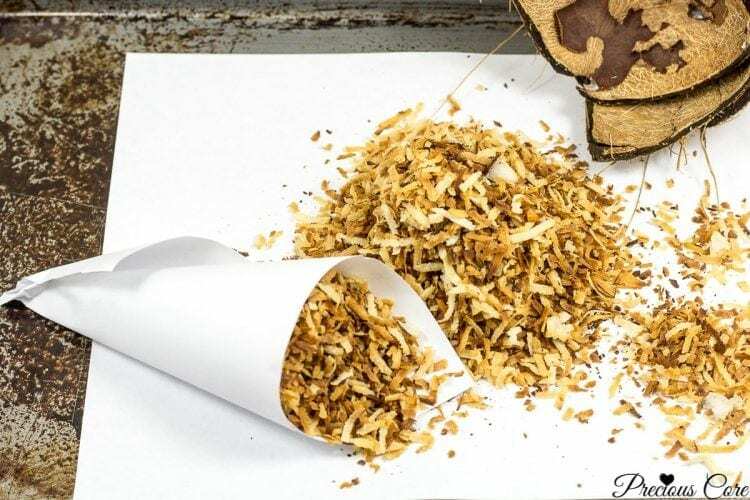 It is homemade Toasted Coconut Flakes at it’s finest – crispy perfectly coconutty and sweet. In Cameroon, this is mostly eaten as a snack just as it is but it can equally easily be incorporated into desserts. Use it as a topping for ice cream or yogurt. Use it to coat frosted cakes. Use it in your crepe or pancake batter. Use it while baking cupcakes, cakes or muffins. OR enjoy as it is. Really, just enjoy it as it is. The struggle to make Cameroonian Coconut Sweet has been real. Back in the day, I would normally buy it from vendors in the market in Cameroon. But now, living miles away from those vendors, I had to figure out how to make mine. July 2016. That’s when I shared my first attempt at making this delight. It didn’t quite look or taste like the one I had eaten throughout my childhood. So I tried some more and my second attempt wasn’t quite good either: it was sticky, too dark and the shapes were off. It was nothing like Cameroonian Coconut Sweet. However, my family ate everything QUICKLY each time I made these failed batches. It turns out that the combination of coconut and sugar cooked in a pan tastes good regardless. But I have been on a mission to make authentic Cameroonian Coconut Sweet and I think I just nailed it! The head of the tasting committee, Mr. N totally approved that this one tasted just like the one back home. I struggled with the shapes initially because I used the bigger shredding side of my box grater. Mr. N advised that I used the smaller side and I quite liked how they turned out. Let’s make some Coconut Sweet, shall we? 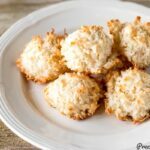 You only need 3 ingredients: 1 medium coconut, 2 heaped tablespoons of granulated sugar and a quarter cup of water (59 ml). Now that’s pretty easy to remember right? 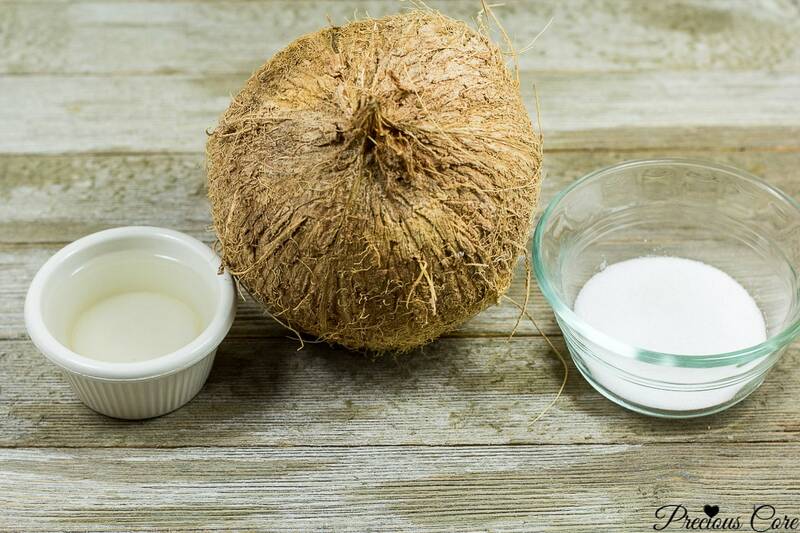 Say it quickly: 1 medium coconut, 2 heaped tablespoons of sugar and a quarter cup of water! The first thing you have to do here is open up your coconut. And if breaking open coconuts is a struggle, don’t worry I got you! Seriously, I would run outside and hit my coconut on a big stone each time I want to open it. No jokes. Haha. I have done this so many times that I think my neighbors have noticed me. But I had to learn a more ‘dignified’ method of opening it so I could show you guys, Because my recipe can’t include something like, “run outside and find a big stone. 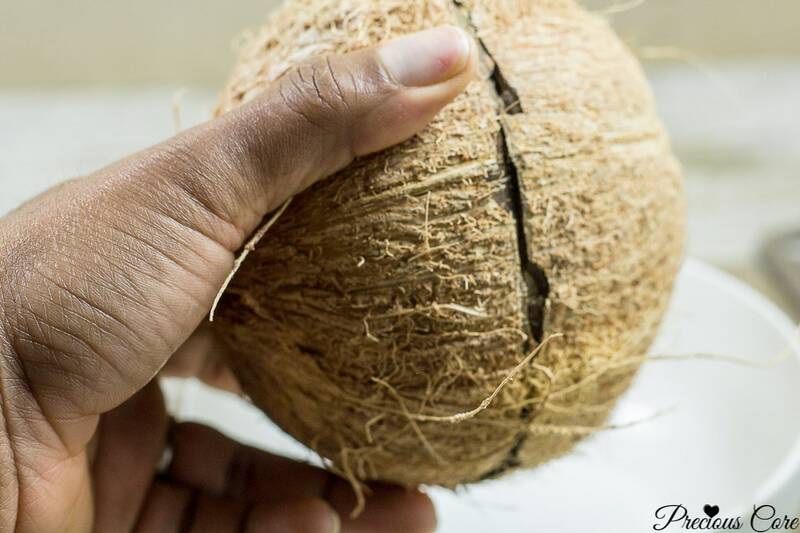 Then hit your coconut hard on it several times until it opens up and the coconut water starts oozing out.” So I learned the method I’m about to show you from Mr. N. This is how he opens a coconut when I ask him to help with that. To open a coconut, you need a butcher knife. Also, be sure to keep a bowl nearby so you can collect that awesome coconut water. As you hit the coconut over and over, it’s going to open up and that awesome coconut water will ooze out. Collect it in a bowl and drink. Then seperate the coconut meat/flesh from the shell. To do this, I normally use a pairing knife to slightly lift up the flesh and take it out. But I found an even easier way to do it. First pop the cracked coconut into a microwave and set on high for 2 minutes. After that, take it out and seperate the meat from the shell with a pairing knife. It will come off easily. If you do not want to use a microwave, you could use your oven instead – bake for about 10-15 minutes at 350 degrees F (180 degrees C). Then you can seperate the flesh from the shell. Now that we have all of our coconut shell, let’s make some coconut sweet. Shred the coconut using the small shred side of a box grater. If your box grater only has one shredding side, it is okay to use that too. Place sugar and water into a non-stick pan on medium heat. Stir until the sugar dissolves then add in the coconut flakes and mix well. Now keep stirring on medium heat until the coconut assumes a beautiful golden brown color. 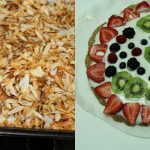 This takes about 15 minutes but keep an eye on it, it could take less time if you choose to use storebought coconut flakes. This will make your home smell like coconut heaven, I tell you! 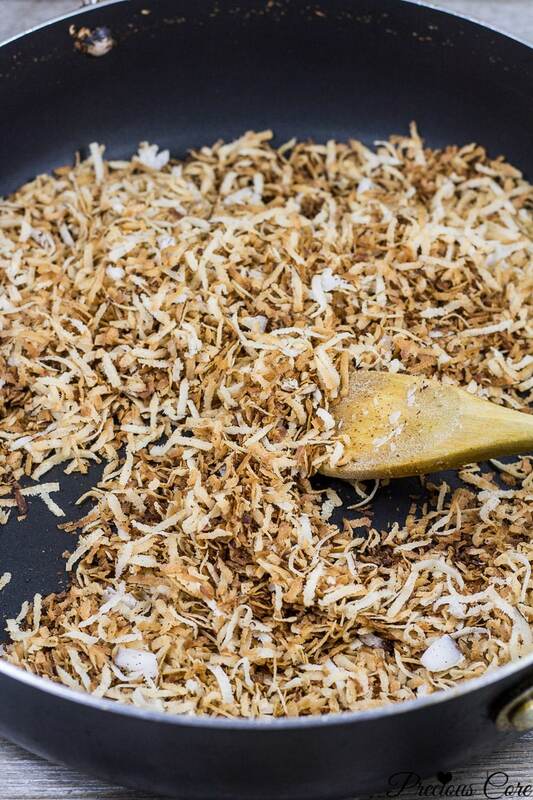 And just like that your very own homemade Toasted Coconut Flakes is ready! Dig in and eat like there’s no tomorrow! 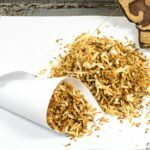 Hope you enjoy this Toasted Coconut Flakes recipe! 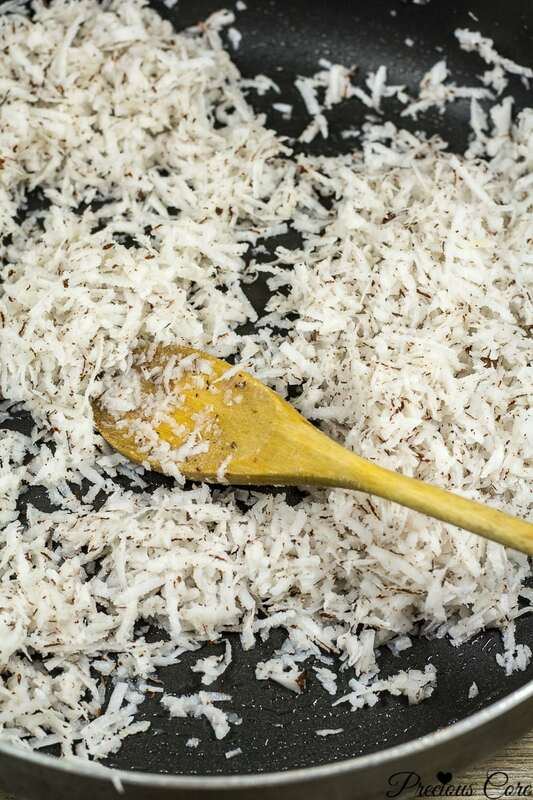 Toasting coconut flakes makes it nuttier and tastier. 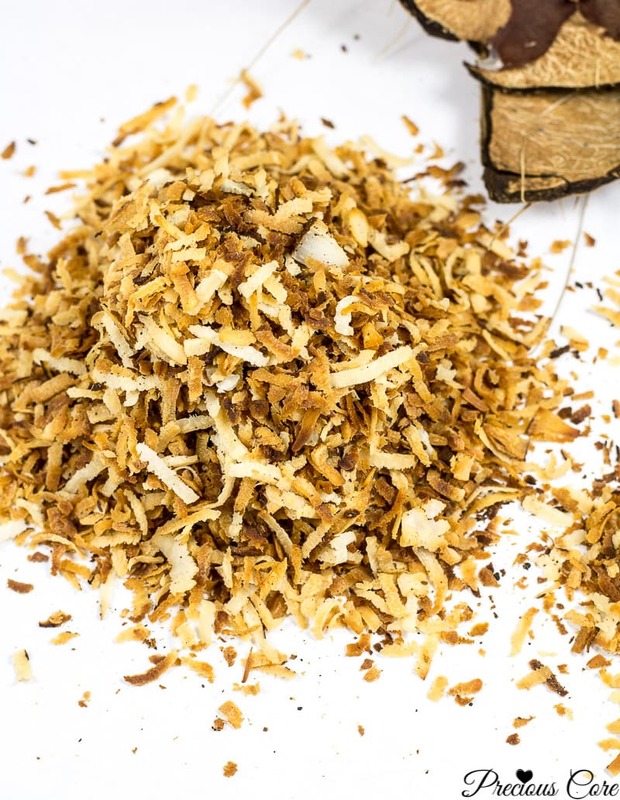 Enjoy toasted coconut flakes as is or add to your favorite cakes, cupcakes, cookies and more! 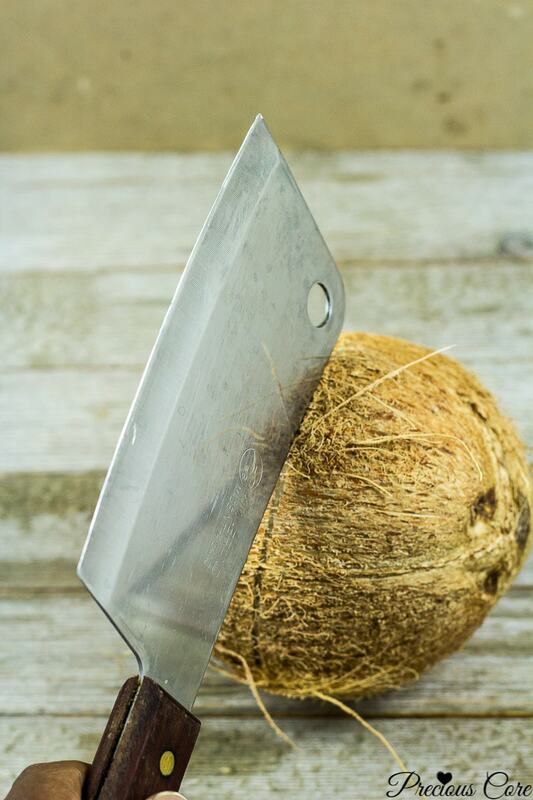 Break coconut open with the blunt side of a butcher knife (note: have a bowl nearby to collect the coconut water). Hold the knife in one hand then hold the coconut in another hand. 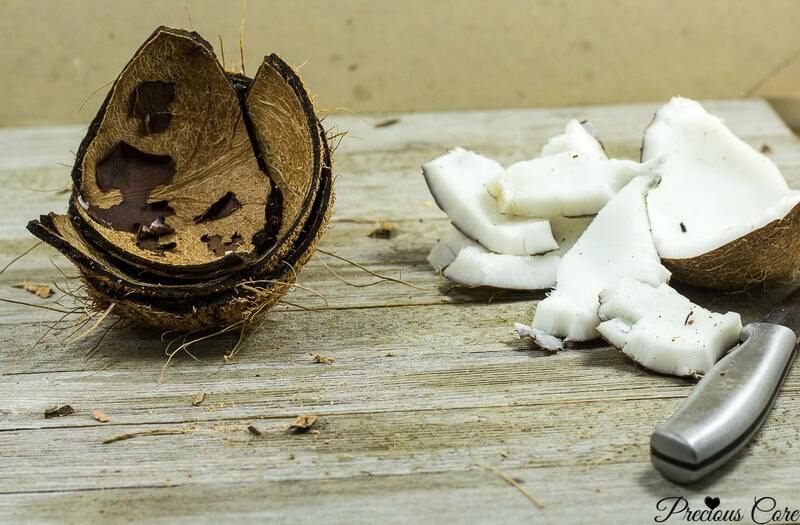 Hit the coconut with the knife several times around its perimeter until it opens up. Pour coconut water into bowl and set aside. Place the opened coconut in a microwave and heat on high for 2 minutes. Alternately, bake it in an oven at 350 degrees F or 180 degrees C for 15 minutes. This process makes separating the coconut flesh from the shell super easy. Use a pairing (small) knife to lift the flesh from the shell. 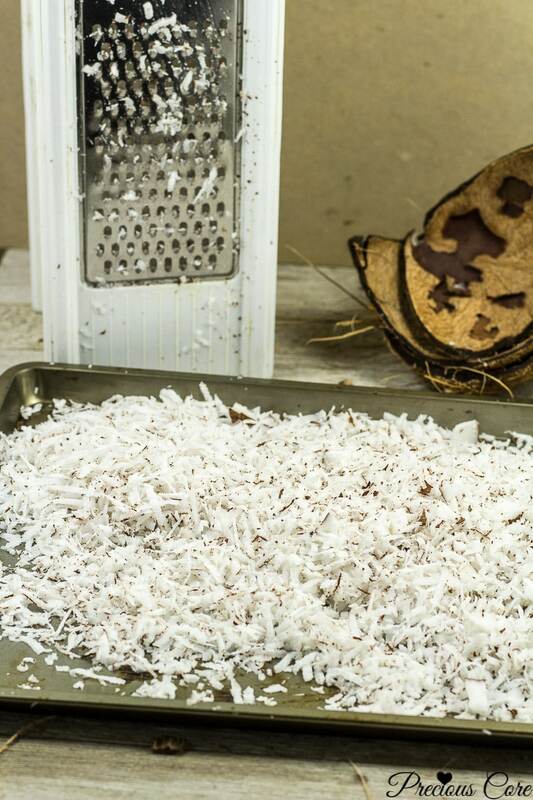 Shred the coconut using the small shredding side of a box grater. Alternately, use the shredding function of your food processor. Place water and sugar into a non-stick pan on medium heat and stir until sugar is dissolved. Add in shredded coconut and mix well to ensure that it absorbs all of the sugary water. 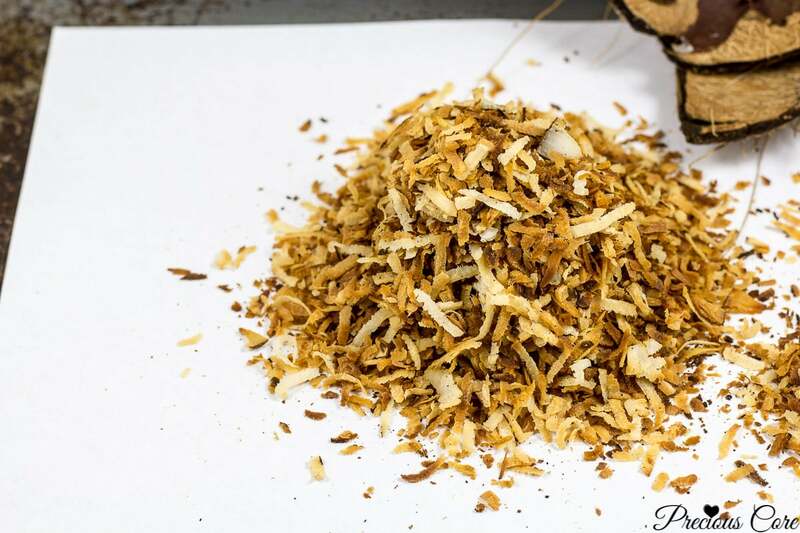 Keep stirring until the coconut turns a beautiful golden brown color. This takes about 15 minutes. Spread on a tray to cool then enjoy! In case of left over how can we store the toasted coconut flakes? Good question, Princess. Store it in an airtight container or put in ziploc bags and close. That way it stays fresh and crispy. Glad you found me, dear! Hope you enjoy the recipe. 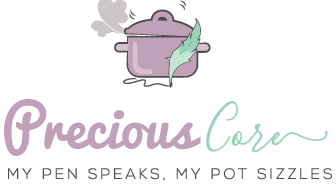 Aunty Precious… Thanks a lot for this blog… I’ve learnt so much from you… And this coconut flakes that Nigerians call Coconut Candy is just my love… Didn’t know it’s this easy..
Ivy, thanks for your kind words. I feel so encouraged. God bless you. I love coconut alot. So many ways to eat this wonderful fruit -coconut. 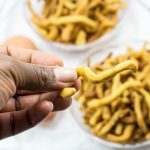 Unfortunately even as I love this snack too but I won’t be attempting making it at home because I am still afraid of cracking coconut on my own since it left me with a big scar on my Palm the last time that I tried cracking it. But I love buying already made coconut chips and flakes in stores. I admire your courage Precious. Your blog has a new face lift, is it a new template please? Awww, don’t be afraid Dominika. If you follow my instructions you should be able to ope your coconut pain free. No, I didn’t get a new template. Only tweaked what I had. Thanks dear. Nice… I make coconut candy two ways. The sticky one and this loose one. We enjoy both in Nigerian the sticky ones are usually molded into balls. Well done dear. We enjoy the sticky ones moulded into balls in Cameroon too. The food fusion in Africa is real. Thanks dear. If we all had a mind like yours then the world be a better place. thanks so much for the coconut sweet recipe,i already tried the recipe but had a problem. Thanks for your kind words. I think you added too much/sugar and or water. Please follow the measurements in the recipe exactly as they are. Also, it could be that you let it stay on the fire for too long so that the sugar caramelised. Please watch my video to see how I make it. Hope this helps. I was going to buy 250 gram for N500. thanks a lot for this dear. 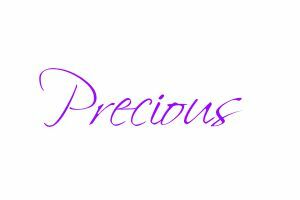 Hi dear, my Facebook is Facebook.com/preciouscore. Just send me a message there. Thanks. 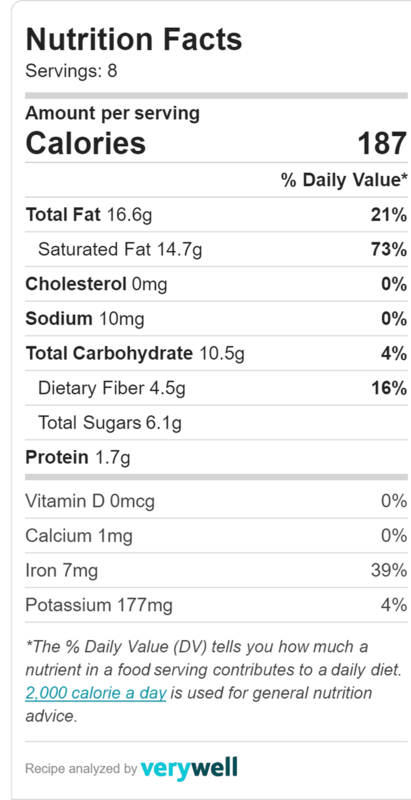 Hi, just browsing the internet for this recipe to find yours and it’s just so well explained. Love it. But please how long can it last in an airtight container, ziplock or the usual packaging nylon. Thank you for the recipe. Hi Justina, so glad the recipe is useful! It could last for up to a month. Just WOW! 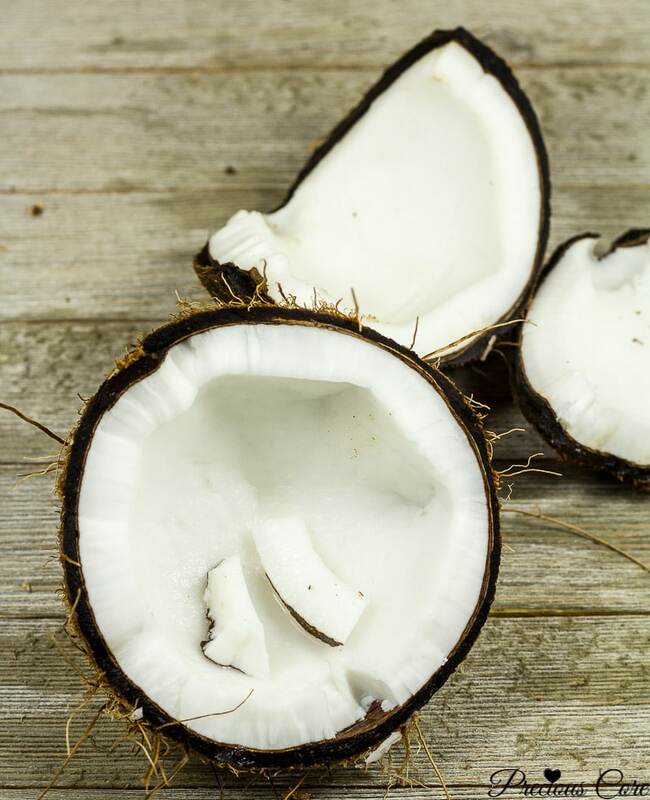 We’ve been trying to eat fresh fruits and vegetables so we thought “let’s try a coconut!” Well, sadly it tasted like soap to us 😞 I decided to google how to make coconut taste better and voila! There was your recipe! WE LOVE IT! Thank you so much for your experimenting and for sharing! This is now a favorite in our home! This makes me so happy, Kerri! Glad you love it and thanks for taking out time to let me know!